As an adult reader, I'm giving this title three stars, but I do believe younger readers will appreciate it more. Teens will no doubt find the Pokemon Go angle addictive, as well as the enemies-turned-crush angsty sweet. Julie Hammerle's writing style flows fluidly, the pacing quick, without over-description, written in a way to engage both younger and older readers without confusion or being 'dumbed' down. Elena and Oliver's families own rival sporting goods stores. Enemies come head-to-head when Elena has to tutor Oliver. I felt both Elena and Oliver were written authentically for their age-group, realistic in their ‘voice,’ and were a good fit for one another. The kids were told to be enemies by their families, and this tainted their interactions and thoughts of the other. They begin chatting with each other via a game app and don't realize it's their mortal enemy. The kids connect, find they truly like each other, but it all gets muddled up with the family feud. This is a perfect recipe for angsty dramatic yumminess. Some great interplay back and forth between Elena & Oliver – banterific. As I stated above, younger readers will eat this book up, but as an older reader, it was hard to swallow the 'reason' as to why there was a rivalry – a bit too over-dramatic, unrealistic, and irrational. Immature on their families' parts, which is a no-no for me (adults not behaving maturely). Just let it go, not infect your children. Recommended to young adult readers looking for a book where enemies turn into each other's crush. Julie Hammerle is the author of The Sound of Us (Entangled Teen, 2016) and the North Pole, Minnesota romance series (Entangled Crush, 2017). She writes about TV and pop culture for the ChicagoNow blog, Hammervision, and lives in Chicago with her family. She enjoys reading, cooking, and watching all the television. 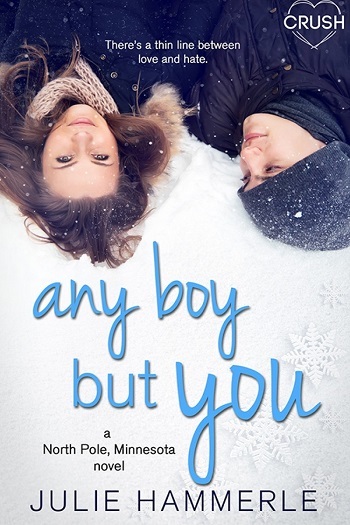 Reviewers on the Wicked Reads Review Team were provided a free copy of Any Boy but You (North Pole, Minnesota #1) by Julie Hammerle to read and review.